"Thank you to our military service members -- the men and women who defend our freedoms and protect our way of life." 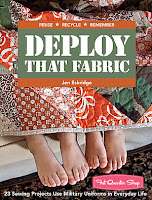 Jen Eskridge opens her book, Deploy That Fabric, with this statement of thanks and appreciation. She also dedicates the book her husband, who is currently still active in the military. Considering Jen's degree in apparel design and her husband's military background, she truly is the perfect fit to write a book featuring 23 sewing and quilting projects using military uniforms. 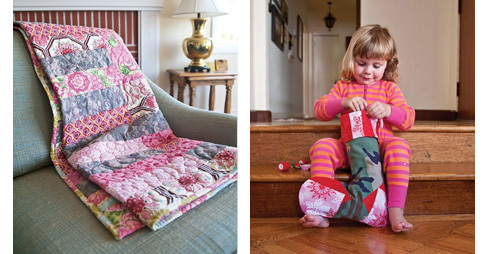 Jen's quilts are a perfect way to snuggle up to your special someone whether near or far. Her purses and bags can help you show your pride and support for the troops. And you can even show you support with this cute Christmas stocking Jen sneaks into the book! So now that you're inspired and ready to create an awesome project using those army greens, let's do a giveaway! (every blog tour needs one, right?!) Leave a comment on the blog telling me what branch of the military your special someone is serving in or previously served in for the chance to win a copy of Deploy That Fabric and this super cute Camo Quilt- Eco Messenger Bag. If you don't know anyone that serves, tell me what branch you would choose to join. You have one week from post date to enter. Oh, and don't forget to check out who else is on the blog tour by visiting Stash Books Blog!